Services / facilities within the building include 8 bedrooms and a kitchen. Related link Reception and Information Centre for Stag Hill Court, University Court and Millennium House. You are on Building Parking (University Court - House 63). Skip to the next section. The car park can be used by permit holders and Blue Badge holders. The car park is located to the rear of university court house 55-60. The dimensions of the designated parking bay(s) are 300cm x 460cm (9ft 10in x 15ft 1in). The nearest designated bay is 30m (32yd 2ft) from the university court house 56. You are on Access To University Court and House 63. Skip to the next section. University Court is located on a hillside. 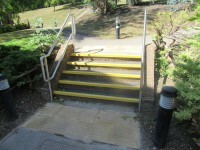 There is stepped access to all University Court residencies. There 15+ deep steps for access to House 63. House 63 has stepped access from all directions. There is similar access to most other residencies in University Court. 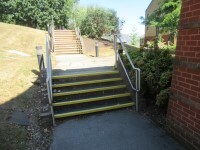 Deep steps with handrails on both sides, clearly marked and tactile paving at the top and bottom of the steps are located at the top of the hillside. 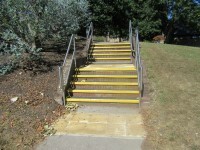 These steps are shown in photographs 5, 6, 7 & 8. A key is required to access the entrance. 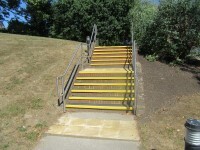 The stairs are approximately 14m from the main entrance.